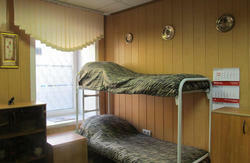 'Admiralty Hostel' contains 6 rooms: 2 Twins (with two separate beds), 1 Double room (with one bed for a couple), 1 room with 4 beds and 2 rooms with 8 beds (all - mix, if other is not requested). 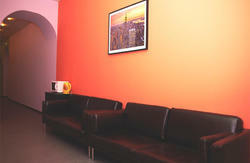 Twin and Double rooms are equipped by TV-sets. From Pulkovo Airport you can get a taxi for appr.$ 30, it takes 30 min depending on traffic. By public transport: Take K213 or 13 bus to Moskovskaya Metro Station. Then take the M2 (blue) line, change at Sennaya to Sadovaya Station, take M5 (violet) line and get off at Admiralteyskaya. As you exit the station, turn left and start walking Malaya Morskaya Street. Take the first turn right and cross the street. We are located at 3 Gorokhovaya Street. FREE TRANSFER in case you book a double/twin for 5 nights and more. There is also a special transfer offer for groups (4 persons and more).